Communicate Green is a project started under the IT2Green initiative. In order to fulfill today’s high demands on mobile network usage, mobile network providers in Germany have around 123.000 base stations working 24 hours a day, 7 days a week with a total power consumption of approx. 1455 GWh per year. The permanent availabilty of those network components causes a significant energy consumption. Through an adaptive, context-aware and technology-comprehensive power management in mobile networks, a considerable amount of energy can be saved by maintaining the high quality of experience at the same time. There are a lot of contextual information present in mobile network components and end devices, which can help to calculate decisions for a dynamic de- and reactivating of network components (e.g., base stations). The main focus of our work in this project is the development of a context entity that aggregates and processes contextual information in order to calculate decisions for network optimizations. By applying various context acquisition approaches, both the network as well as the user view will be included into the power management process. Within the project, SNET and T-Labs developed a demonstrator, which visualizes the effects of power management algorithms under realistic conditions. For further details, please visit the ComGreen Showtable page. 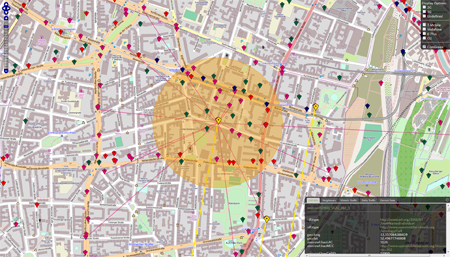 The OpenMobileNetwork for ComGreen Demo visualizes how interlinked semantic data can be useful in order to establish a power management in mobile networks. 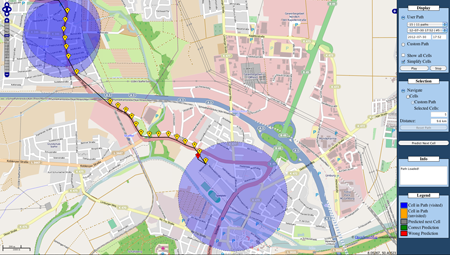 For this purpose, we extended the OpenMobileNetwork by several new features, such as dynamically calculated coverage areas, neighbor relations or traffic generated by smartphones at runtime. Furthermore, we enhanced our visualization by a ComGreen button that runs the following SPARQL query in order to determine the cells that are candidates for network optimizations in the area of Schöneberg: "Request all T-Mobile base stations that cover Telekom in Schöneberg with traffic below 4 Mbits and neighbors covering the same area by 70%". Please feel free to have a look at the special OMN ComGreen Visualization. You can see live traffic produced by your smartphone, if you run OpenMobileNetwork for Android (OMNApp), which is available for download at Google Play Store. In order to implement energy-efficient reconfiguration mechanisms in mobile telephony networks as proposed by the project Communicate Green, it is essential to anticipate traffic hotspots, so that a network's configuration can be adjusted in time accordingly. Hence, predicting the movement of mobile users on a cellular level of the mobile network is a crucial task. We have implemented a Movement Prediction System that allows to determine the future movement of a user on a cellular level using precomputed movement patterns. The performance of the algorithm is evaluated based on real and live user movement data from the OpenMobileNetwork. Furthermore, the predicted user movements are visualized in the OpenMobileNetwork Predictions Visualizer. Please do not hesitate to have a look at the demonstrator! SNET is part of the ComGreen Video that was produced by the Federal Ministry for Economic Affairs and Energy (BMWi) in order to introduce the idea of ComGreen! You can see the ComGreen Video at Vimeo!